I always find Missoni's men's clothes not particularly easy to wear. Maybe it's because I tends to wear monotone clothes in general. I'm usually not big on wearing multiple pattern on myself with exception of shoes. Otherwise, I stay with the typical palette of blue, khaki, gray, brown, black, with some occasional pink, yello, and orange. This particular vest I find hits all the right note for me. It has the typical zigzag pattern that champion by Missoni yet it's rather subtle and you won't notice it until you look at it closely. The color palette is also very suitable for most guys. The vest pattern looks like a typical flannel shirt you would find in a Levis store, etc. But yet, upon close inspection, the pattern is much more sophisticated not to mention the beautiful yarn that was used as well as the expert workmanship. Best of all, the vest is reversible which means you can get two looks for the price of one! 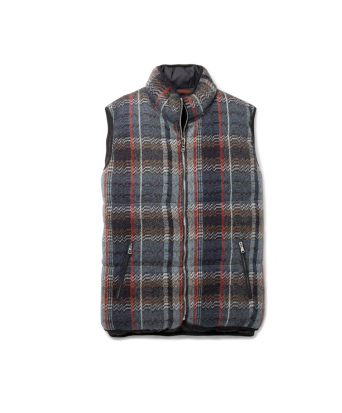 You can find the vest at your local Missoni boutique or at Mr Porter.